This blog is maintained by high school beat reporter Phillip Suitts and the semoball.com staff. Phillip has been a reporter for the Southeast Missourian and semoball.com since September 2016. An Atlanta native, Phillip graduated from the University of Maryland in May 2016. He worked for the independent student newspaper, The Diamondback, and has interned at The Montgomery Advertiser and Atlanta Journal-Constitution. 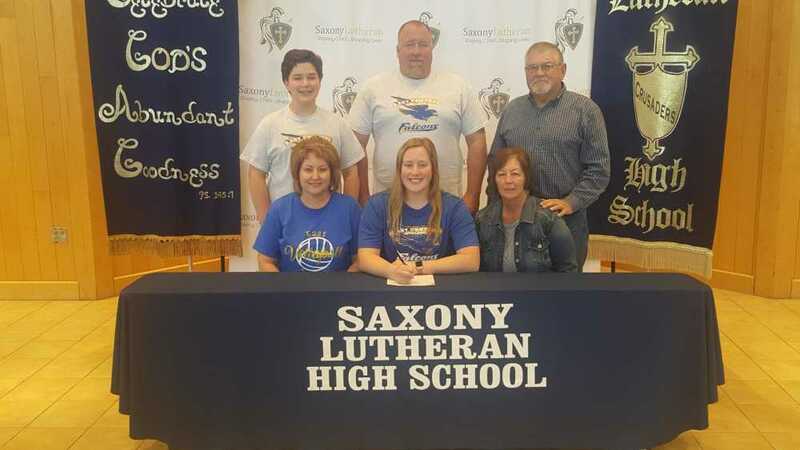 Saxony Lutheran's Macy Morehead signs with East Central College. Pictured front row from left to right: mother Tracy Morehead, Macy, grandmother Debbie Cooper. Pictured back row form left to right: brother Tanner Morehead, father Rob Morehead, and grandfather Jim Cooper (submitted). Saxony Lutheran senior Macy Morehead signed to play volleyball at East Central College on Monday. Morehead was selected to the 2018 All-Southeast Missourian Volleyball team after compiling 331 kills and 354 digs as a senior this past season. The outside hitter also made the Woodland All-Tournament team and earned all-district honors. East Central College is a community college located in Union, Missouri.